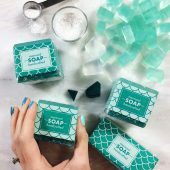 This melt and pour soap is easy to make and brings a bit of the sea into your home. 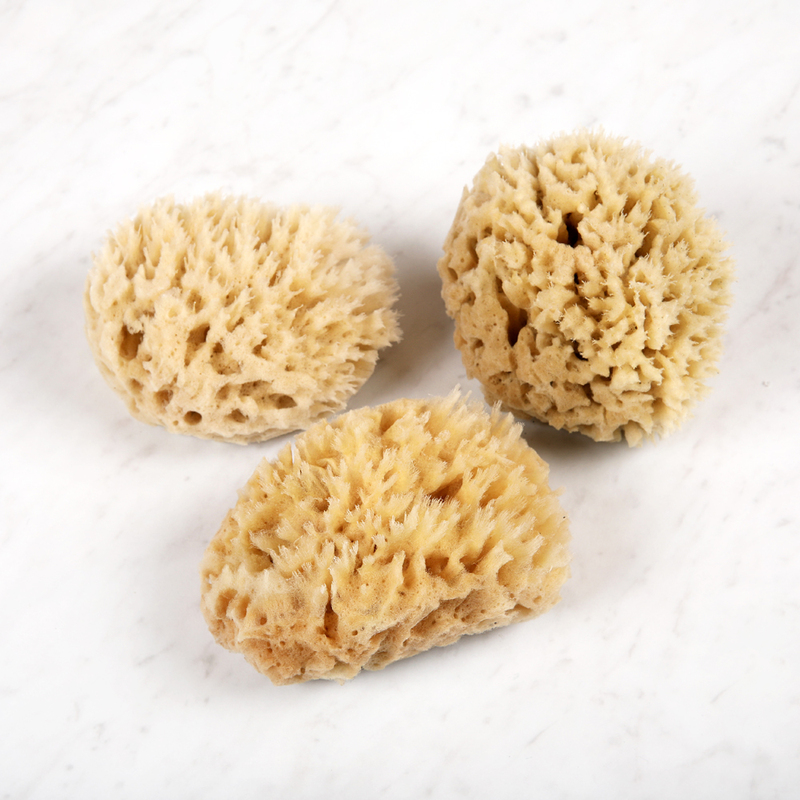 The wool sea sponges are quite soft and help promote a dense lather. 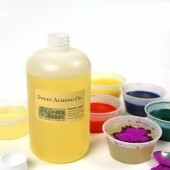 The deep color comes from jagua blue extract, a natural colorant. 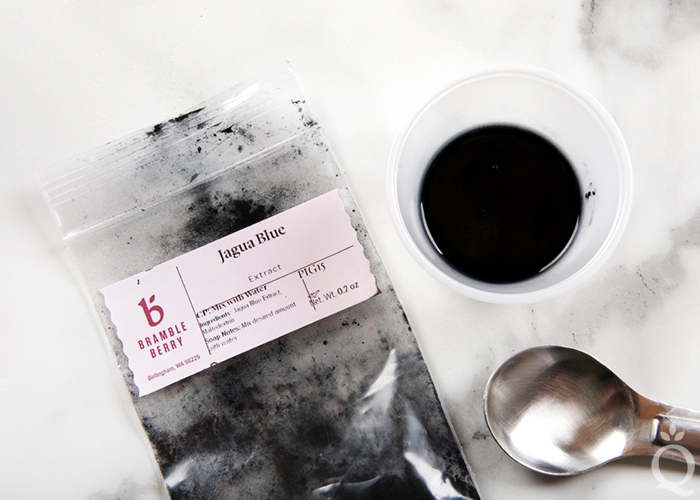 Jagua blue extract is a unique ingredient. It comes from the Genipa americana tree, which is native to tropical forests in North and South America. 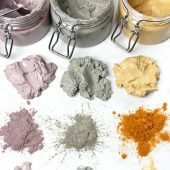 It’s very pigmented and a little goes a long way. 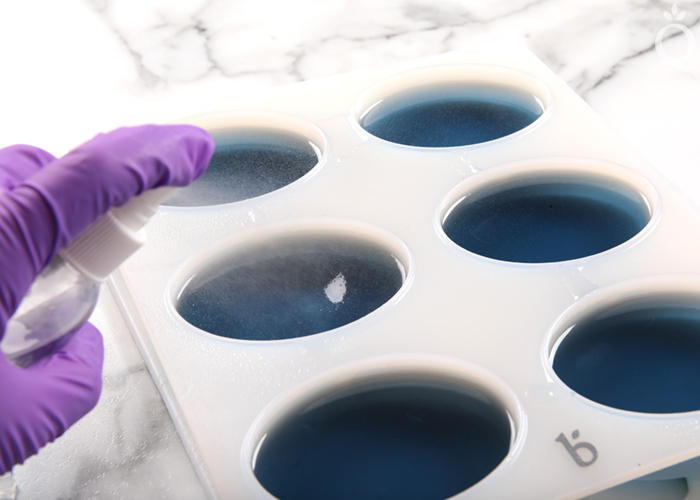 To use in melt and pour, we like to mix it with 99% isopropyl alcohol to get rid of clumps and then add that directly to the melted soap. 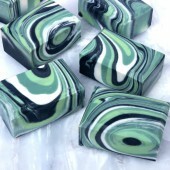 These soaps are scented with Midnight Waters Fragrance Oil. 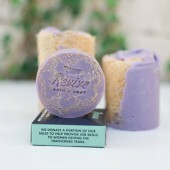 It’s a deep and complex scent with notes of bergamot, deep sea water, and patchouli. 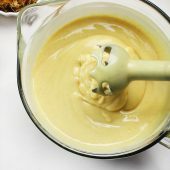 It does discolor to a light tan, so this recipe uses Vanilla Color Stabilizer. 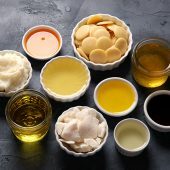 Midnight Waters Fragrance Oil, jagua blue extract, and sea sponges are part of the new Seascape Collection – explore all the products here. 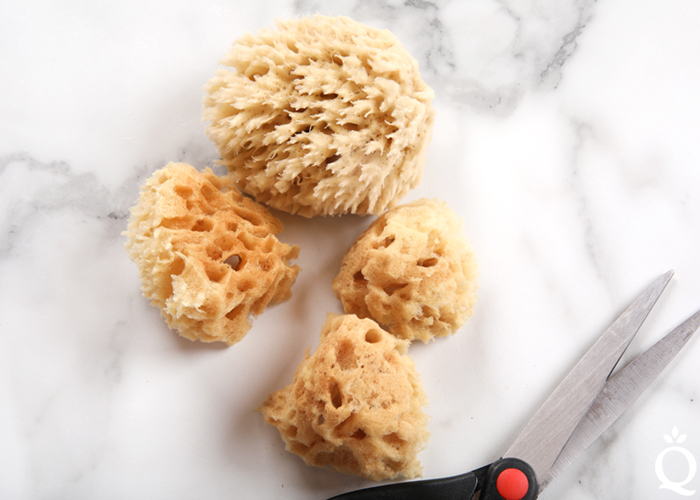 SEA SPONGE PREP: Cut the wool sea sponges into about 3-4 pieces. 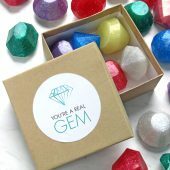 We cut them into 3 pieces, but you can make them smaller or larger if you want. 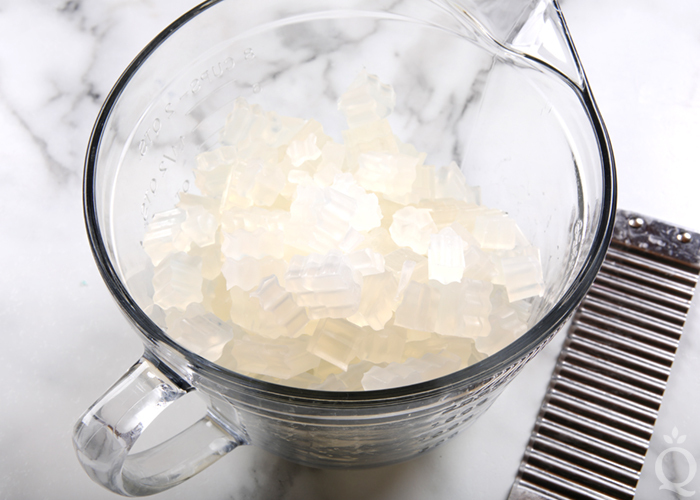 ONE: Chop 29 ounces of Clear Melt and Pour Soap Base into small, uniform cubes. 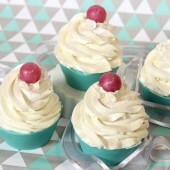 Place them into a heat-safe container and melt in the microwave using 30-60 second bursts. Stir between each burst. 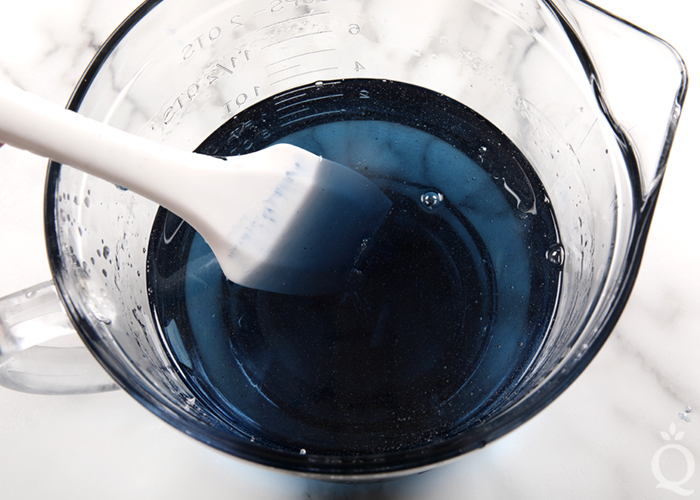 TWO: While the soap is melting, mix together 1/16th teaspoon of jagua blue extract and 2 teaspoons of 99% isopropyl alcohol. Mixing the jagua blue extract with alcohol helps prevent clumps. 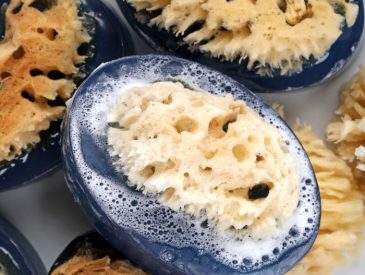 THREE: Once the soap is melted, pour all of the dispersed jagua blue extract into the soap and stir until completely incorporated. 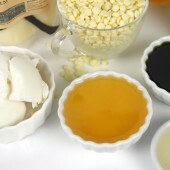 FOUR: Add 0.6 ounces of Midnight Waters Fragrance Oil and 0.6 ounces of Vanilla Color Stabilizer. Mix together. FIVE: Fill each cavity of the mold about 80% full. Spritz the top with alcohol to help get rid of bubbles. 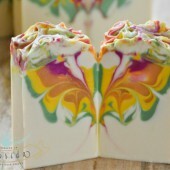 Allow this layer of soap to harden and cool for about 15-20 minutes. The soap needs to build a strong enough skin to support the sea sponge. 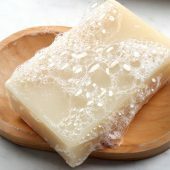 SIX: Once the soap has slightly hardened and formed a strong skin on top, reheat the remaining soap using 15 second bursts. Spritz all the cavities with 99% isopropyl alcohol to help the layers stick together. 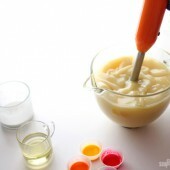 SEVEN: Fill the cavity with melted soap. 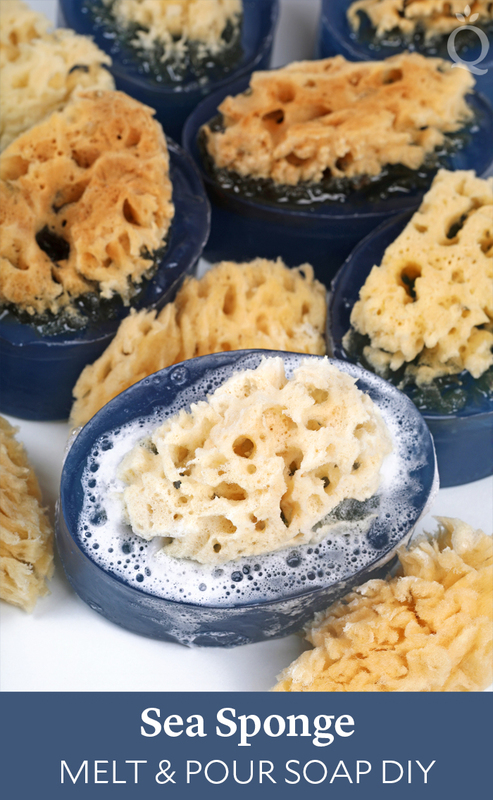 Once full, place the sea sponges into the soap. Spritz the soap with 99% isopropyl alcohol to get rid of any bubbles. Continue for each cavity. 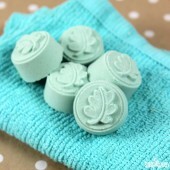 EIGHT: Allow the soap to fully cool and harden for several hours or up to overnight. 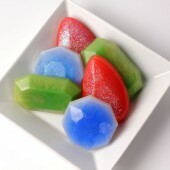 Once fully cool, remove the soap from the mold and enjoy. 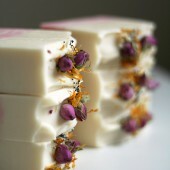 To prevent glycerin dew, wrap the soaps in plastic wrap and store in a cool, dry place. 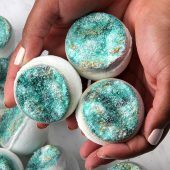 These sea-inspired melt and pour bars have amazing lather. 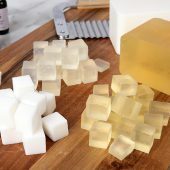 Chop 29 ounces of Clear Melt and Pour Soap Base into small, uniform cubes. 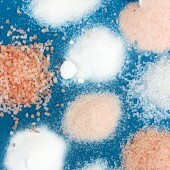 Place them into a heat-safe container and melt in the microwave using 30-60 second bursts. Stir between each burst. 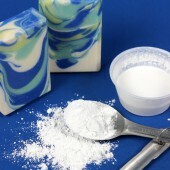 While the soap is melting, mix together 1/16th teaspoon of jagua blue extract and 2 teaspoons of 99% isopropyl alcohol. Mixing the jagua blue extract with alcohol helps prevent clumps. 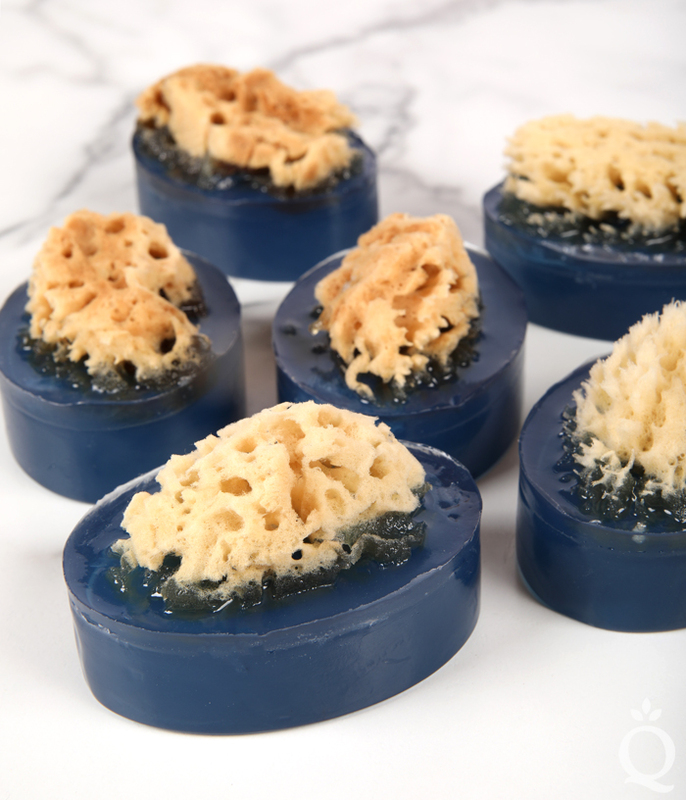 Once the soap is melted, pour all of the dispersed jagua blue extract into the soap and stir until completely incorporated. 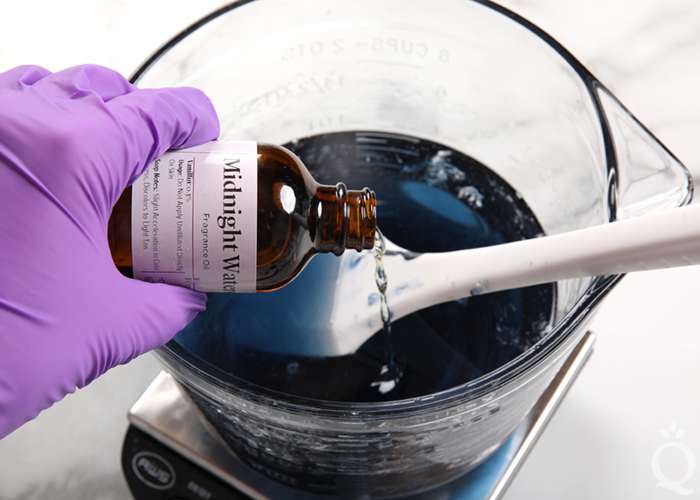 Add 0.6 ounces of Midnight Waters Fragrance Oil and 0.6 ounces of Vanilla Color Stabilizer. Mix together. Fill each cavity of the mold about 80% full. Spritz the top with alcohol to help get rid of bubbles. 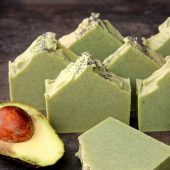 Allow this layer of soap to harden and cool for about 15-20 minutes. 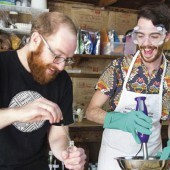 The soap needs to build a strong enough skin to support the sea sponge. 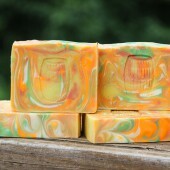 Once the soap has slightly hardened and formed a strong skin on top, reheat the remaining soap using 15 second bursts. Spritz all the cavities with 99% isopropyl alcohol to help the layers stick together. Fill the cavity with melted soap. 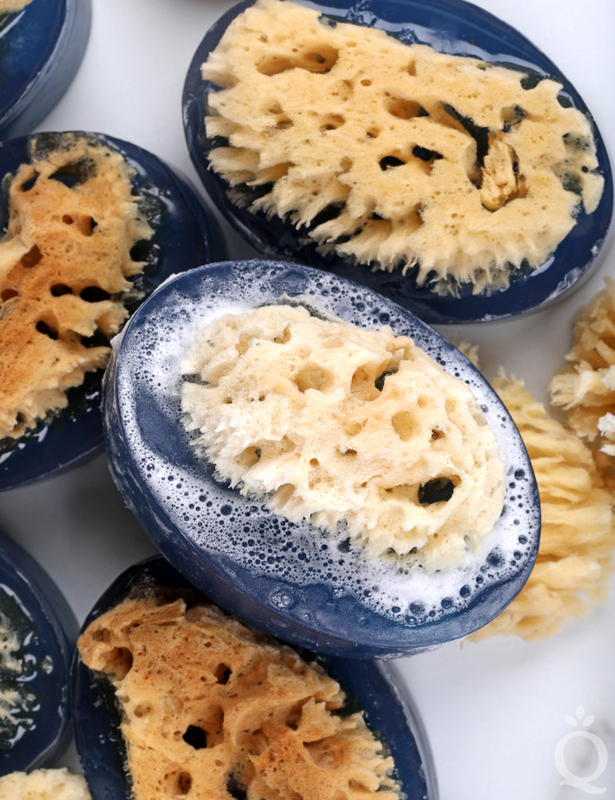 Once full, place the sea sponges into the soap. 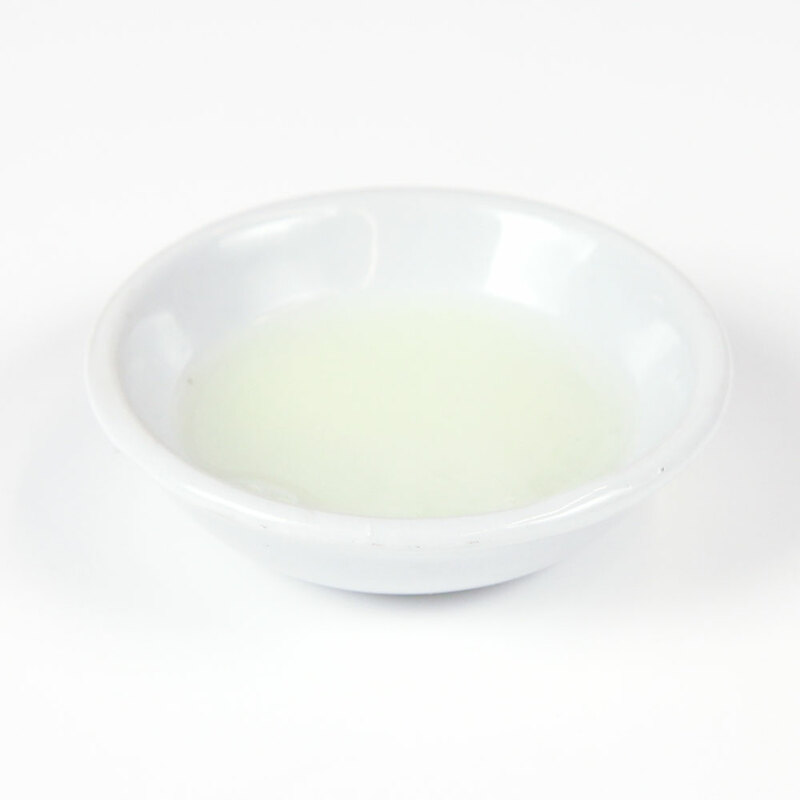 Spritz the soap with 99% isopropyl alcohol to get rid of any bubbles. Continue for each cavity. 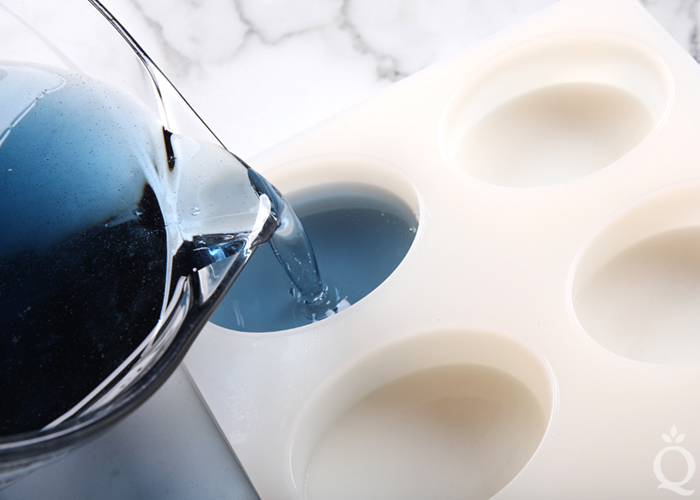 Allow the soap to fully cool and harden for several hours or up to overnight. 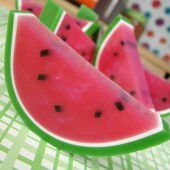 Once fully cool, remove the soap from the mold and enjoy. 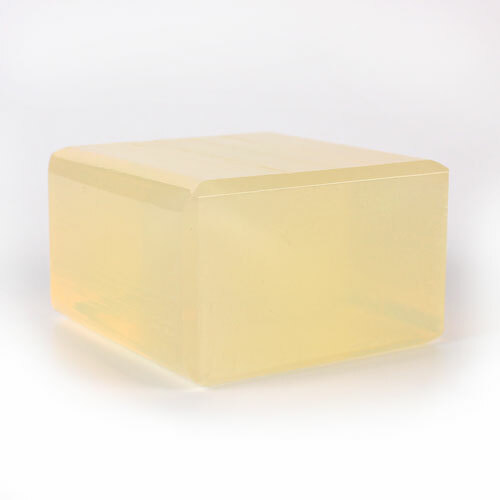 To prevent glycerin dew, wrap the soaps in plastic wrap and store in a cool, dry place. Just made this over the weekend. 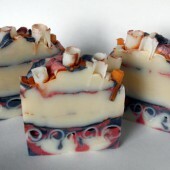 I allowed the soaps to sit and harden for at least 4 hours, however, when I tried removing my first bar from the mold it separated between the layers so I now have two pieces of soap. I’m afraid to try and remove the other 5 bars. I sprayed 99% alcohol on the first layer before pouring the second layer so why is it not starting together as one bar? Very disappointed. Sometimes you need more 99% alcohol than you expect to keep them together. To fix it you can melt a little bit more soap and sort of paste the layers back together. 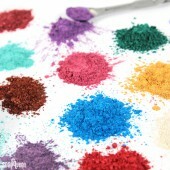 Be sure to mix the Jagua powder with water before mixing with alcohol, otherwise it turns into a gummy clump. 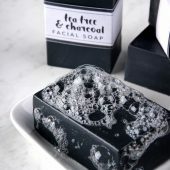 This soap smells fantastic, I’m giving it to the men in my family as Christmas gifts! 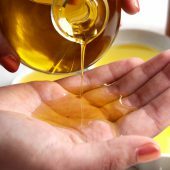 Can I use essential oil instead of fragrance oil in this recipe? 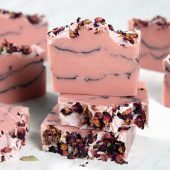 I’m thinking of trying this for my first ever batch of soap but I’m not comfortable using a fragrance oil due to skin sensitivity. Thanks. 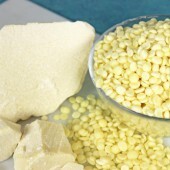 I am adding some Lotus Flower Extract to mine for the hydration benefit. I don’t see why you couldn’t just use that if you didn’t want the fragrance. 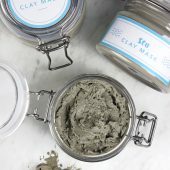 The site says it is safe to use in soap. Also, I had just used the Midnight Waters fragrance in my first soap so I wanted to try something different but still refreshing, so I’m trying a very small amount of the Neroli and Shea fragrance. 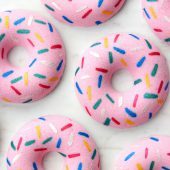 Would the sponges risk growing mold or bacteria since it will be wet and sitting in a damp shower? 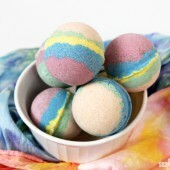 Normally you and wring out sponges and let them air dry. 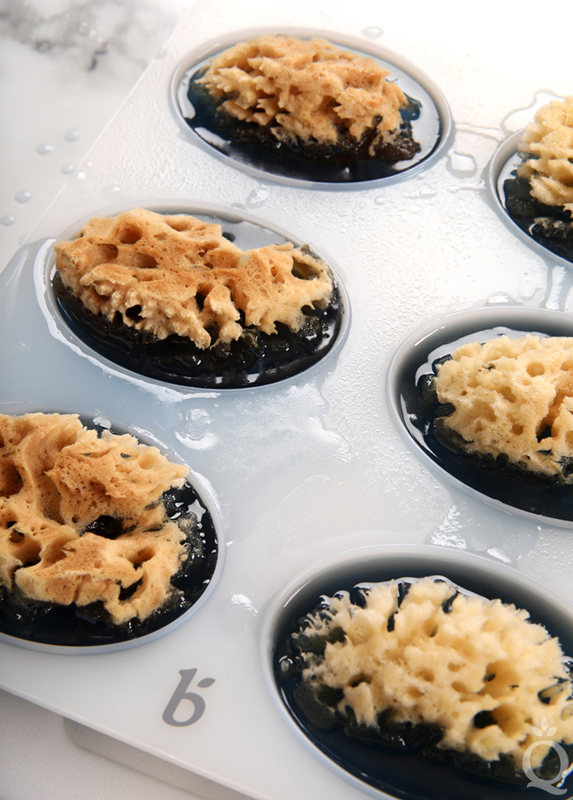 Soap has a pH that does not allow for the growth of bacteria so the melt and pour will be protecting your sea sponge from growing any as well. 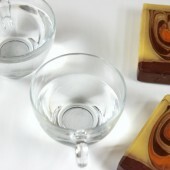 How long do these melt and pour soaps lasts, that is, do they have any expiry date. We would recommend using them within one year. 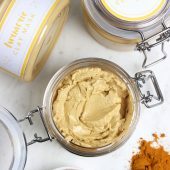 I just wanted to know that if natural ingredients like honey, dried rose petals, crused almonds etc could be used in the melt and pour base. Honey and the rose petals should be fine, but I think the crushed almonds will be too prone to molding. 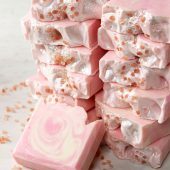 We wouldn’t recommend adding milk powders to Melt and Pour soap because it is already a finished soap. 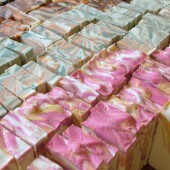 In cold process soap the milk goes through saponification with the soap which extends the shelf life. 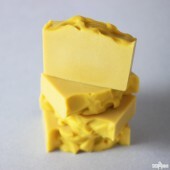 In M&P that does not happen so the milk proteins will end up going rancid in the soap. I would like to make this as a compliment to the Easy Creamy Cucumber lotion. 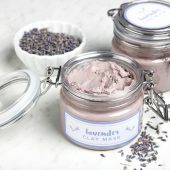 What substitutes would I need to make in order to for it to smell and look similar to the Cucumber lotion? 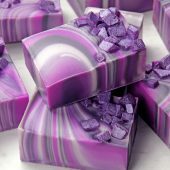 I’m new to all of this and this would be my first attempt at making soap. Thus, not sure what adjustments to make. 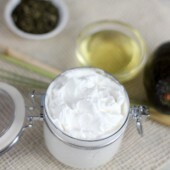 Using the same fragrance, colorant, and extract would make this a nice compliment to your cucumber lotion recipe. Thank you, Matt, for the quick response. 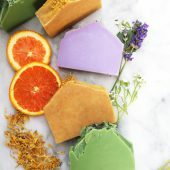 So I can use the emerald lab color and kermit green mica for coloring in the soap? How much of each? The cucumber extract would be the same as the jagua blue extract I’m assuming? 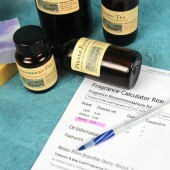 The green tea and cucumber fragrance oil I can figure out using the fragrance calculator. 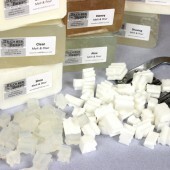 For micas I would start with about 1/4 -1/2 tsp per pound of melt and pour soap. 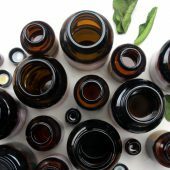 LabColors are quite strong so you would want to use a very small amount after diluting them. The cucumber extract is not the same as Jagua Blue Extract. 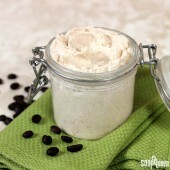 The Cucumber Extract is a botanical extract and does not provide any color or scent. These are actual sea sponges. They are named for their texture and are not made of silk or wool. 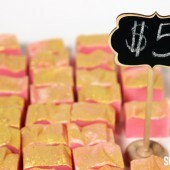 This tutorial uses Wool Sponges. Hope that helps! Hi. I got all psyched about trying this — only to find that you’re out of the Jagua Blue Extract. What would you suggest as a substitute? 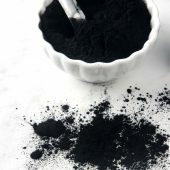 Indigo Powder is a good natural colorant, but it is a little more gray. 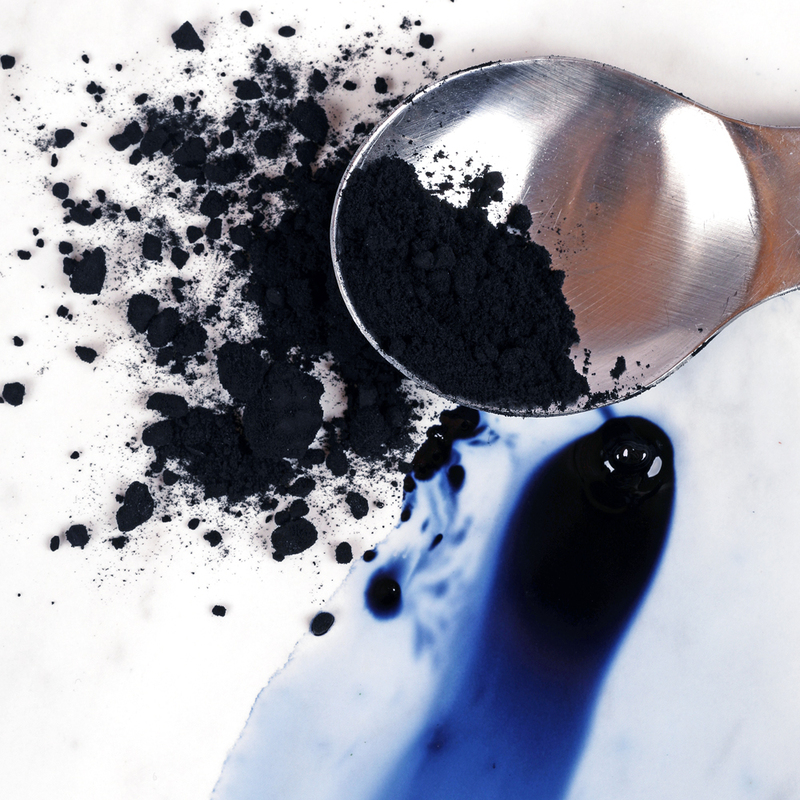 It could be mixed with Ultramarine Blue Pigment to make it a little brighter. 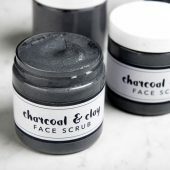 You can also add a little black to make it a darker shade. There are other vendors who sell stabilizer for CP and it has worked well for me. I just used the sample bottle of Midnight Waters I got this morning. 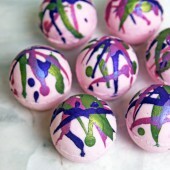 I paired it with Indigo powder in CP soap. 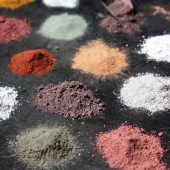 This will be my first time using indigo powder, and I am excited to see the result. 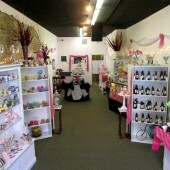 The fragrance is a lovely fragrance; it has a hint of sweetness and a little hint of spice I was not expecting. I expect this to be a lovely soap. Thanks, ElsieLila! 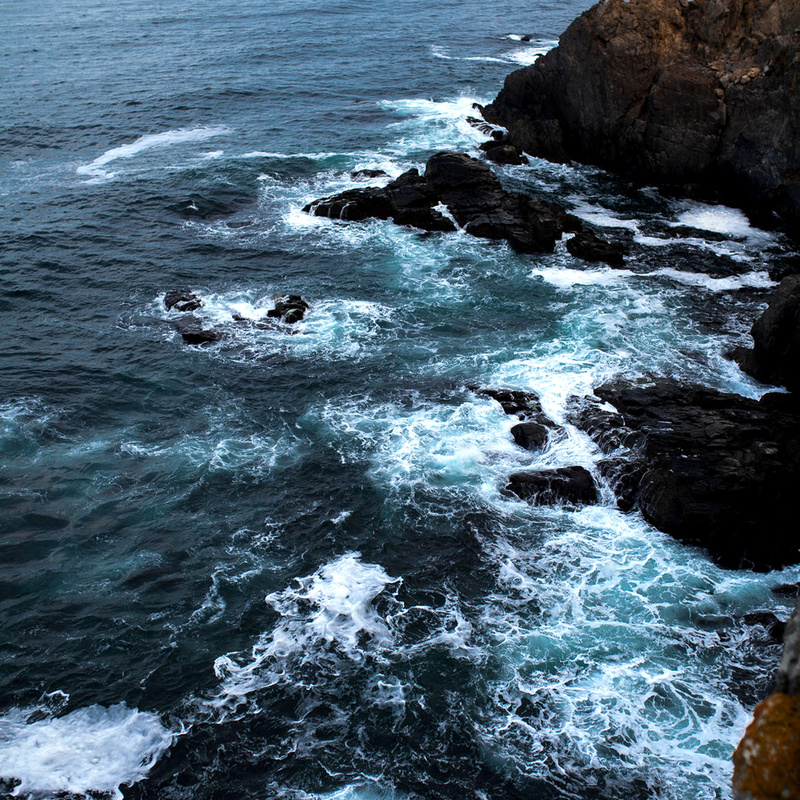 We love Midnight Waters, too. That is a beautiful blue! 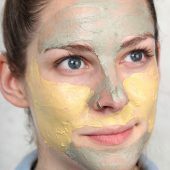 Why do you use a vanilla stabilizer on such a dark color when the scent only turns a light tan? Just wondering! 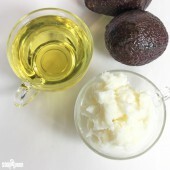 Does anybody know why it doesn’t work in cold process soap? Thanks for all you do on this site. I love it and I’ve learned so much over the years! Thanks, Eric. We really like the color the Jagua Blue Extract creates, too. 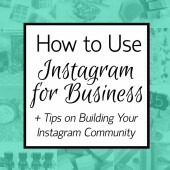 We used the Vanilla Color Stabilizer because we wanted it to stay true to that dark color. 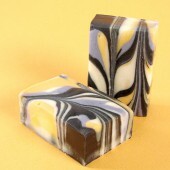 We’re not sure why the Vanilla Color Stabilizer doesn’t work that well in cold process soap. We’ve gotten mixed results whenever we’ve tried it.